Four easy steps to perfectly clean paint! The McKee's 37 Xtreme Paint Decontamination Kit includes the perfect selection of paint decontamination products that pro detailers prefer. Featuring everything you need to deep clean paint and remove damaging ferrous particles before applying a coating, this incredible kit is an absolute necessity for anyone serious about paint care and protection. The McKee's 37 Xtreme Paint Decontamination Kit includes the basics, like McKee’s 37 Extreme Foam Formula Auto Shampoo, McKee’s 37 Universal Clay Lubricant, and McKee’s 37 Universal Detailing Clay, and adds to that the professional grade decontamination power of McKee’s 37 Xtreme Iron Remover and of course, McKee’s 37 Wax Remover for Plastic—a formula the pros know and trust! When used as the first steps to your detailing routine, the McKee's 37 Paint Xtreme Paint Decontamination Kit provides an impeccably clean surface for you to correct to a perfectly smooth finish, and then protect with your favorite wax, sealant, or coating. After all, perfect paint comes from a perfectly smooth foundation! 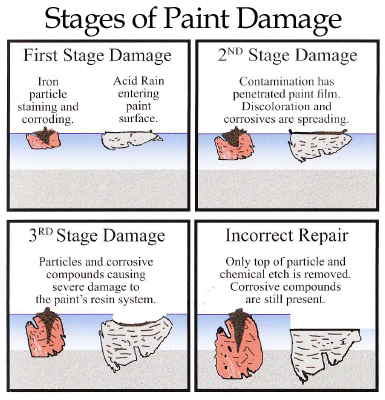 Remember, it only takes a single flake of iron to start a complete paint system breakdown! McKee's 37 Universal Detailing Clay is a special clay compound that safely and quickly removes contaminants that penetrate below the clear coat surface. Detailing clay is the professional detailer’s secret to glassy smooth paint. Always use McKee’s 37 Universal Clay Lubricant when claying your vehicle to ensure ample lubrication and prevent accidental marring. The Surface Prep Clay Mitt is designed to make paint decontamination easier than ever before. This detailing clay alternative features a soft mitt coated in a high-tech rubberized material that pulls embedded contaminants away from paint when rubbed over the surface. The Surface Prep Clay Mitt can be used again and again, and the best part is that if you drop it, you can rinse it and reuse it, unlike traditional detailing clay which has to be thrown away if it falls on the ground! Always follow the decontamination process with polishing if necessary and a coat of your favorite paint protection product. McKee’s 37 360 corrects, cleans, and protects in one easy step, making it the perfect choice for use after decontaminating your vehicle’s paint. A total retail value of $131.92. Save $51.93!